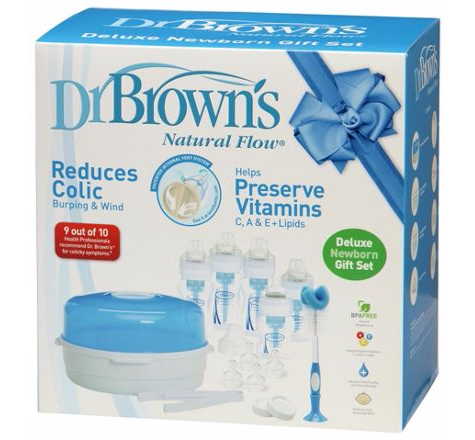 The Dr Brown's Deluxe Feeding Set contains all the equipment an expectant mother needs, and also makes an ideal baby shower, or new birth gift! The patented system with an internal vent is designed to create a 'vacuum-free' environment. This eliminates the air bubbles found in most baby bottles. 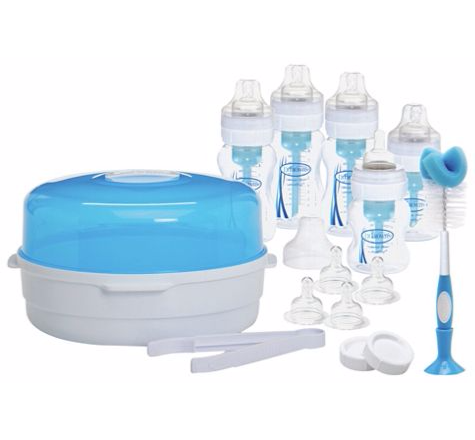 It allows air to enter through the teat collar, without being incorporated into the breast milk or formula. The air is then channelled through the internal vent system, to the area behind the feed. Babies are able to feed more more comfortably because the vent allows babies to feed without fighting the negative effects of a vacuum or the discomfort of ingesting air bubbles. This reduces colic, burping and wind. The breast milk or formula flows freely through the teat as the air is channelled to the top of the bottle. This no-vacuum effect eliminates teat collapse. Level 1 teats already supplied one each bottle. Please note: You must at least follow or like Unique Young Mum and Dr Brown's on at least one social media platform! To find out more about Dr Brown's, and to view their full range of products, check out the official website here.